← My church….standing in the light. Welcome to the Community Library! Young volunteers at work. I love libraries. Therefore, I love people who love libraries – like the indomitable Angela Tuson who works for ITEC, Institute of Training & Education for Capacity-building a non-profit organization in East London on the east coast of South Africa. This area is called the Transkei and during apartheid was subjected to the government’s appalling “Bantu Education” system for non-whites. Today, most of the people there still live in poverty and struggle with literacy, but there are many signs of hope. 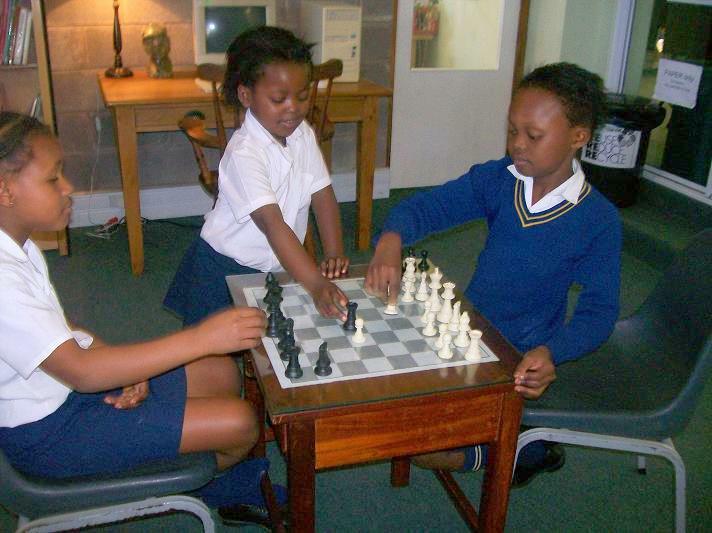 Learning chess at the library. ITEC was founded in 1987 by Gerry Nicholl, a feisty teacher who wanted to help other teachers deal with a painful lack of support and resources in this system. 23 years later, ITEC is still going strong and Angela’s part in it is “a lovely one” as she describes it, hosting a Community Library with a staff of two, and a bunch of volunteers from ages 7 to 80. The library’s ethos is based on being a resource and lifeline for the community, promoting Lifelong Self-Driven Learning & Environmental Responsibility. 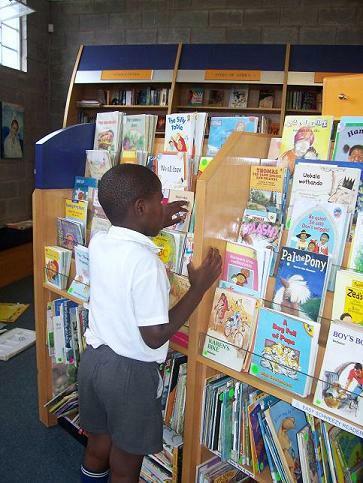 Most of the books are used, but there is fiction and non-fiction for every level of reader, the staff and volunteers recycle everything, there’s a garden of indigenous plants, and library policies are all about kindliness and helpfulness. You can read whatever you like. 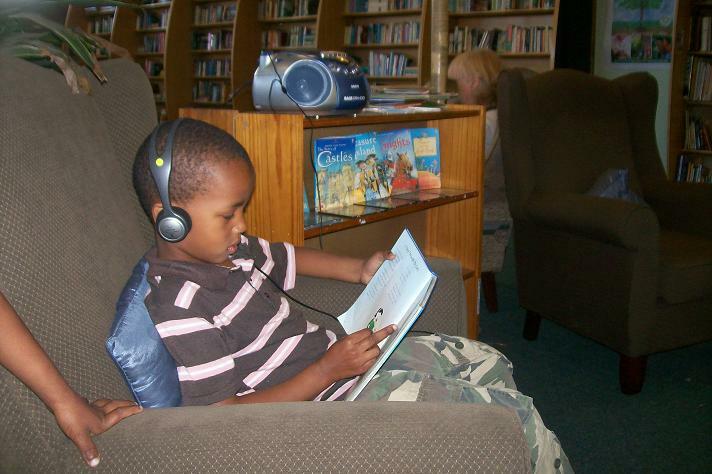 Patrons can use the library’s PCs and TVs for job hunting, resume writing and news, and little ones often come in after school, so Angela has set up story-telling, reading hours, homework help, and big comfy nap zones. 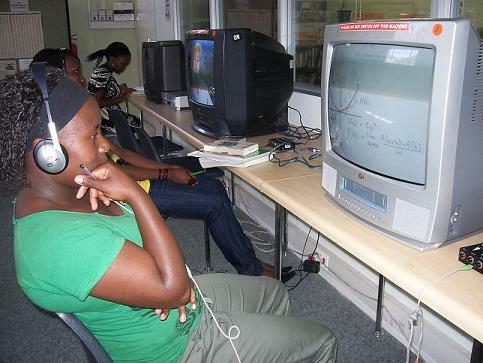 Because many folks can’t read very well, the library also has films, curriculum, stories, radio, internet – and lots of earphones – as well as puzzles, games, chess tables, toys, legos, posters and art stations. It’s a full entertainment center for the community and a place that welcomes everyone. Angela and her co-worker also train others to build libraries in their communities that are child-friendly, no-fines, and have only 3 rules: Quiet, Sharing and Respect. 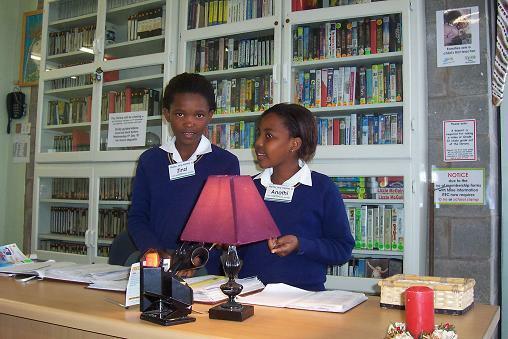 A library ITEC started in a children's home. 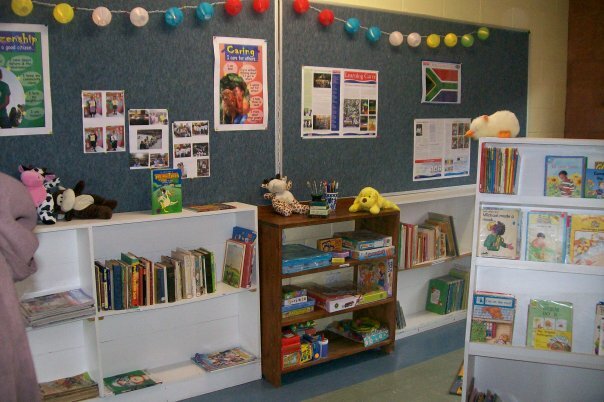 For teachers in rural schools in the Transkei province who are “ridiculously low on resources” as Angela succinctly puts it, she offers block loans of books, toys, games, posters, puzzles, art and digital equipment, microscopes, lamps, cushions and plants to use in their classrooms for 3-6 months at a time. Caught up in the magic of reading. Great stuff! Contributing both $ and books to libraries that need them is a great way of helping human assets to grow. A few years ago,I shipped about half my theological/psychological/philosophical collection (several hundred books) via “Pastors for Peace” to the Interdenominational Protestant Seminary Librarary in Matanzas, Cuba. More recently, I’ve been able to help a school kids giving project in Menlo Park. CA. Turns out that one of their 6th grades (then) was organizing her friends of all ages to ship books to kids/schools/libraries in Africa. Projects such as these create giving assets of all kinds – not least in the giviers.Any readers are welcome to get in touch to see how they can help facilitate such activities and projects of their own. The Library – what would civilization be like without libraries and the access to learning, information, knowledge, visions, insights, wisdom and new and wonderful new possibilities? So glad you are supporting ITEC! I’ve visited their fantastic library in East London, South Africa and some of the libraries they’ve helped get started, too. Angela is a dynamo and a very creative librarian. As Americans, it is difficult to comprehend how not having access to books and information shapes our relationship to ourselves and the world. Great cause, Betty!